An Iron Man mask, a 20-sided die, an iPhone case and a stretchy bracelet. What do these seemingly unrelated items have in common? They were all printed by Nohtal Partansky’s 3D printer. Partansky is a Tech graduate student who works in the Aerospace Systems Design Laboratory (ASDL). While he first began working on his 3D printer during the summer before his senior year of college, the design has just now taken off. “I’m trying to market it to as many people as possible and hopefully build a business around it,” Partansky said. His design, he believes, is simpler to use. This is partly because he has tried to take as much work out of the printing process as possible. For instance, his printing process does not require the user to use tape or hair spray to “set” the creation after it prints. More so, Partansky’s design is larger than others, measuring in at 25” by 16” by 25”. This allows it to print larger creations in one printing, rather than multiple, more laborious printings. But overall, Partansky found the lack of resources most difficult. Because he couldn’t just go to a store and buy the parts to a 3D printer no one else had invented, he had to make the parts himself. Partansky worked sometimes all night after his graduate research and classes on his 3D printer. Certain parts took weeks to make, especially, says Partansky, the y-axis component. However, getting his own 3D printer to work was reward enough. Having his 3D printer work even better than he expected and, according to Partansky, better than his competitors was icing on the cake. His friends, too, were proud of his accomplishment. They especially loved the carbon-fiber blackbird he printed “because they are all Aerospace, you see,” said Partanksy. Partansky is especially proud of how many different materials and colors his 3D printer can use, and use at the same time. For instance, when printing the 20-sided die, he was able to use two different colors of ink to differentiate the numbers from the die itself. Material wise, Partansky’s 3D printer is incredibly diverse. His printer can combine different materials, while most can only print one at a time. It can also print using carbon fiber, which is rare in a 3D printer. Even more, Partansky’s 3D printer can do two materials printed over each other. Of everything he has printed (and he has printed a lot) Partansky says he is most proud of his Iron Man mask. “It was just so cool,” said Partansky. 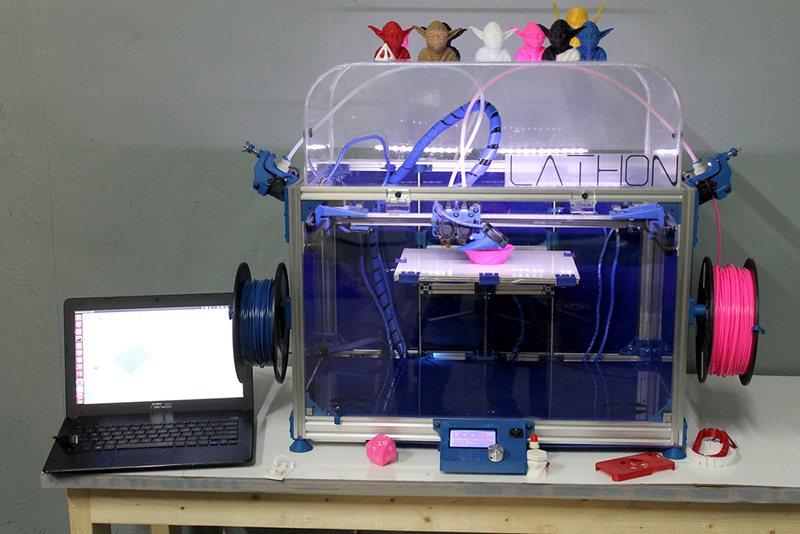 This week, Partansky hopes to print an entire lamp that will be battery operable. He is also planning on printing his largest creation ever, a pyramid, which will probably take 20 to 30 hours to complete.